Draw String Burlap Bag in 3 Assorted Colors. Mini Santa Sack with Two Faux Coal Lumps make a Fun Holiday Christmas Tree ORNAMENT or Table Decoration . with TWO (2) Realistic Black Plastic Coal lumps, each approx 1.25-inch (3.13cm) Diameter. 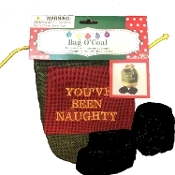 YOU'VE BEEN NAUGHTY Bag Of Coal is just the right Ugly Christmas Sweater Party Favor Prop or Contest Consolation Prize! Earn a lot of laughs with our Bag Of Coal Santa’s Helper Elf costume accessory. Assorted color RED, GREEN or TAN burlap sack with Golden Yellow Embroidered YOU’VE BEEN NAUGHTY. Two real looking artificial black lumps of coal are plastic, so won't make a mess! What a fun gift idea for both young and old ... anyone who has been bad this year! *Note: In case you didn’t know, if Santa leaves lumps of coal in your stocking instead of sweet treats, it means you have been naughty or misbehaving. Even if they haven't been naughty, this gift will surely bring a smile to the receiver. Fake coal sack includes an embroidered draw string burlap gift pouch and 2 pieces of realistic-looking black lumps of coal.